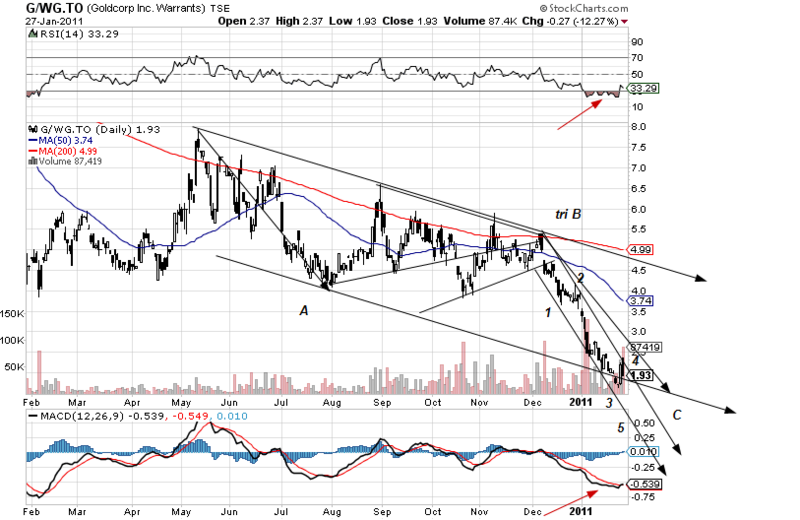 A few weeks ago I suggested that ABX and Goldcorp were an outright sell given the pattern that they had then completed. 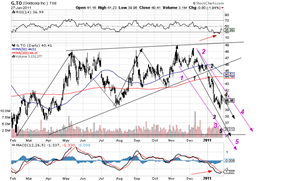 The targets then (and now) were/are $36 and $35 resp. We are 3/4 along the way so what now? Here are the charts. To see the previous blog go to the index at the top of the website, or enter the code.! So we dropped from $49 to $39, pretty drastic already but not yet at the target (lets use $36 to have a little margin). Will it actually get there? Do not know for sure but it is the target so no harm in waiting for it. 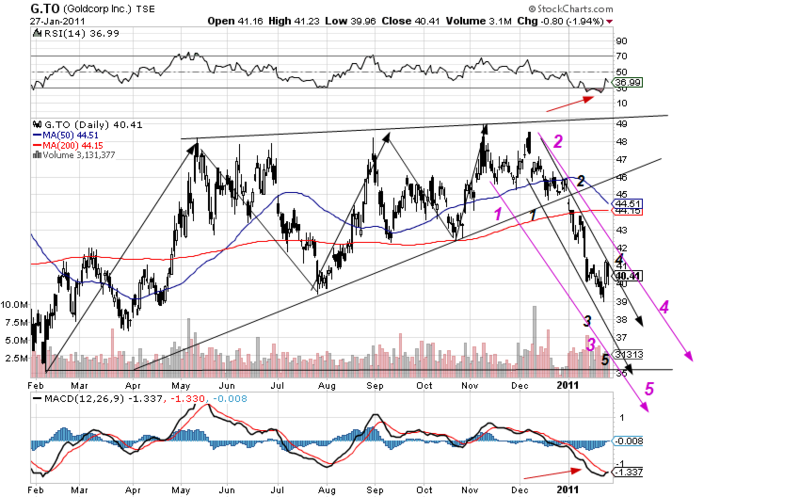 Note the RSI is already at a one year extreme and so is the MACD. But the count does not appear complete. Looking at the warrants, I have no idea what the strike or expiration date is, but for these purposes that is not immediately relevant, it is clear that they dropped from $6 to $2 in the last leg down. That is more than 60% against 20% for the stock itself, or about 3x as fast. Suppose the stock does go to $36, it would then probable rebound about half of what it lost, about $6 to $7 (to about $42/43). The warrant will drop to about $1 and rebound to $3, a much better return – with a lot less risk! Do sell when that happens as this warrant has an awful time-decay.